A great place to relax and get away! Fantastic Fishing and Hunting is what it’s all about! 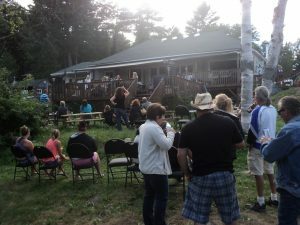 Mountain View Fishing and Hunting Lodge is located approximately 4 1/2 hours North of Toronto, or 3 1/2hours East of Sault Ste Marie, or 6 1/4 hours West of Ottawa, Ontario. Sudbury with a population of over 165,000 is only 45 minutes away and offers major shopping, theatres, movies, fine dining, popular fast food restaurants, hospitals, and “Science North”, where you can discover the history of the Northern Mining, fishing, animal life, and more. Just minutes from the lodge, are Buckridge Golf Course, Catfish Horseback Riding Stables and the Town of Markstay with Churches and Post Office. We are a four-season resort with activities for the entire family! Situated directly on Nepewassi Lake, we offer a casual, friendly atmosphere for fishing and/or hunting or just a relaxing family holiday. We also cater to special family reunions or company gatherings. Our comfortable, rustic decor housekeeping cottages sleep from 2 to 12 people and our newest cottage on the waterfront is wheel chair accessible. In addition, we have private treed trailer sites, lots of boat docking spaces and a private sandy beach. During the winter months we offer all inclusive ice fishing weekend specials, rent ice huts, and have 5 insulated cottages ready for your winter fun! 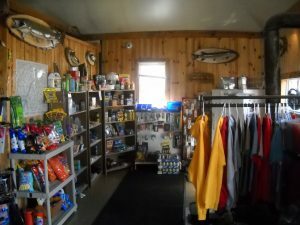 The Lodge has a small but well stocked convenience store, tackle and bait, ice, pay phone, & a borrowing library. We have outdoor activities for the children, a fully equipped playground. New things are being added each year. Come mid-August, the hunting season kicks in and we offer fall Black Bear Hunting packages, as well as moose and small game hunting, Our experienced guides conduct a well organized bear hunt for our guest, and the success rate has been excellent! We look forward to the same excellent results this year. Nepewassi Lake is 16 miles long, with an average depth of 15 feet, with holes up to 60 feet. 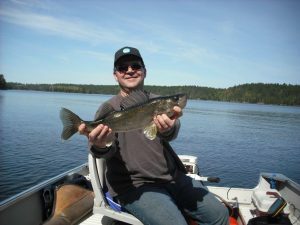 Considered on of the cleaner lakes in the area, Nepewassi is home to Walleye (Pickerel), Pike, Bass, Perch, the “Mighty Muskie”, Tiger Muskie and Burbot. Still to be caught is the 63 pound Muskie caught, tagged and released by the Ministry a few years ago! Perhaps it is waiting for you!! The Fall is the best time for Muskie, although they have been caught throughout the fishing season. In the years that we have owned Mountain View Fishing & Hunting Lodge, for the comfort and safety of our guests, we have made many improvements to the property. Added facilities, long overdue, expanded the trailer park area, and introduced family activities for all to enjoy. During this time, we have enjoyed meeting our guest from all walks of life and from as far away as Texas, British Columbia, England & Germany! We look forward to seeing all our past guests again and to meeting new visitors at Mountain View for many years to come.